First, let’s talk about the introduction of the coveted Member Mastermind Cup! You’ve probably seen these make an appearance on our live events, or maybe you’re even one of the lucky ones who already have theirs! In this blog post, we want to, once and for all, clear up all the ‘myths’ surrounding this exclusive CC Award. Yes! YOU can also win one of these. It’s simple, really. As long as you have Wi-Fi and a camera, you’re all set! You just need to hop onto one of our regular Member Mastermind events and perform any trick of your choosing. You see, these cups are pretty darn rare. We only have a few of them. We’re not going to sell them, and we’re not going to just GIVE them away. In this life, most cups can be purchased. But the CC Member Mastermind Cup must be earned. We all love magic. We love to study it, practice it and perform it. We love using it to amaze people. But to us, the best thing about magic is the friendships you make with fellow passionate magicians. At its core, the CC Club exists to create those friendships. For us, that’s what it’s all about. Every month we host a special online event called the Member Mastermind. As a CC Member, this is your chance to join us on screen—introduce yourself to your fellow members—and share a trick with the group. You can perform your favorite trick, or share a ‘work in progress’. We love to see what you’re working on, and no matter where you are in the journey, we pride ourselves on being the most supportive group of magicians anywhere. We created the Member Mastermind because we want to meet you—and we know that ‘magic life’ gets ALOT more fun once you find your buddies. And the best way to make that happen is to come onscreen and say hello! We know the first time you come onscreen, it can be a VERY exciting experience. In fact, it can be downright exhilarating! Over the last few years, when a new member appears on Member Mastermind—it’s sort of a ‘rite of passage’. At Conjuror Community, appearing on Member Mastermind is how you become a ‘made’ magician. Part of the gang. To us, this is more than just a cup. It means you’re part of a family. In many ways, that’s the highest compliment we can give. Participating in a Member Mastermind is an AWESOME first step toward securing your cup. But you’re not quite there yet. 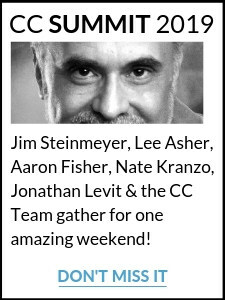 If you want to receive an exclusive CC Cup, you need to appear in THREE Member Mastermind events. Now, onto the second awesome announcement…the Conjees! We thought it was about time this unfortunate oversight was fixed, which is where the ‘Conjees’ came from. 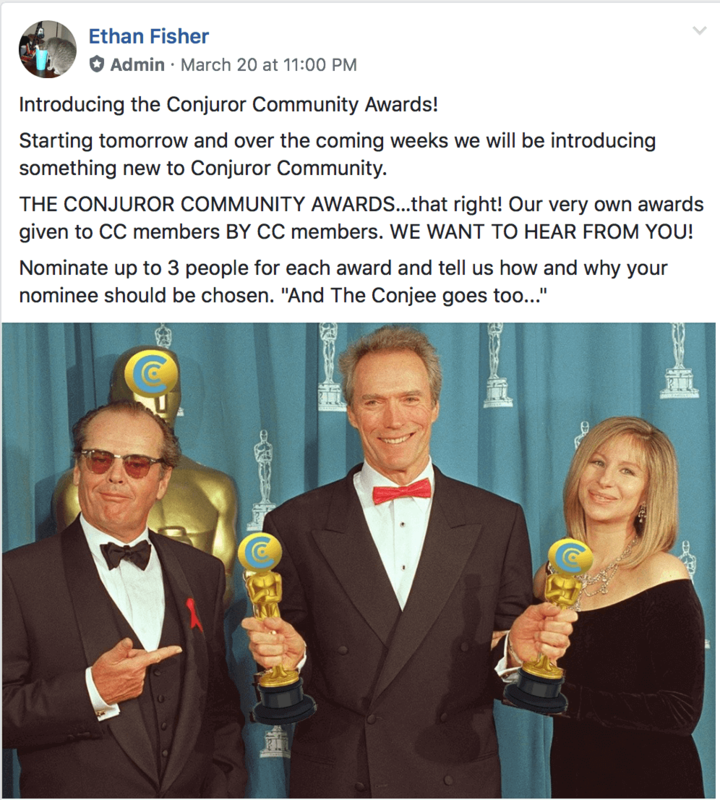 The Conjees are our very own ‘Oscars’—only with a magical twist. And YOU have a chance to win! This week’s category just happens to be the ‘Team Player Award’ —why not go and vote right now while you’re here?